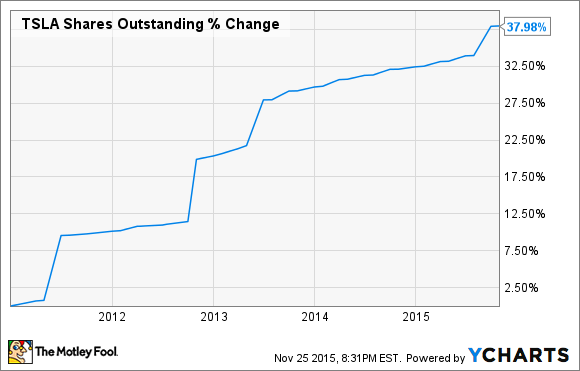 Will Tesla Motors Stock Rise Above $300 by 2020? There's a lot of debate about the future of Tesla Motors. Three of our analysts weigh in on where they think this stock is headed. There's a lot of debate about where Elon Musk is going to be able to take Tesla Motors (NASDAQ:TSLA) in the next five years. The company is investing billions of dollars to expand production capacity, and customers are waiting to see what the "affordable" Model 3 will look like. But competitors have begun investing in EVs in earnest, and by 2020 there could be a dozen EV competitors. So, will Tesla Motors be a stock worth holding or a risk that doesn't pay off for investors? Here's what three of our analysts think. It's easy to build a financial model that shows Tesla Motors being worth over $300 per share if it can deliver 500,000 vehicles per year by 2020, as planned. For example, that many vehicles at an average price of $50,000 apiece with a 10% net margin could bring in $2.5 billion in net income, which means that a $300 share price -- or $39 billion market cap assuming no dilution -- would be just 15.6 times earnings five years from now. That's not including any sales from Tesla Energy, which is set to take one-third of the Gigafactory's production. On paper, Tesla is arguably undervalued by those metrics. But Tesla's problem has always been executing on its audacious growth targets. The Model X was supposed to be completed in 2014, but it won't reach any sort of scale until 2016. Model S delivery projections for 2015 are expected to come in nearly 10% lighter than Tesla predicted early in the year. The Model 3 is supposed to start rolling off production lines in 2017, but there are already rumors floating around that delays into 2018 are imminent. This wouldn't be a concern for an automaker that wasn't trying to build a new market, but that's exactly what Tesla is trying to do. Every delay gives BMW (NASDAQOTH:BAMXF), Audi, VW, Nissan, GM, Ford, and others time to build their own electric vehicles and even competing hydrogen vehicles and infrastructure. By 2020, competition in EVs will be fierce and competitors may be able to build more market share than investors hope if Tesla's delays continue. The other challenge to watch for is falling sales costs. To grow sales to 500,000 units, Tesla will have to sell vehicles for far less than the $75,000 cash cost the Model S starts at today (by 2020, Tesla's federal tax credit will be depleted). Even the BMW Group, which sold 2.12 million vehicles in 2014, averaged just $37,700 per vehicle. And the company's net margin was 7.2%, lower than the assumption I used above. Falling prices aren't necessarily bad, but they mean your margin per vehicle sold goes down, which you have to make up for with volume, which then puts pressure on hitting sales targets. If Tesla Motors misses any one of those targets, the value of the company could fall apart quickly. Using the same model as above, let's say Tesla sells 400,000 vehicles in 2020 for an average price of $40,000 and a 7% net margin. Suddenly, a $39 billion market cap would be 35 times future earnings, more than double the 15.6 P/E ratio I laid out above. But that's what missing targets could lead to for investors. I'm not saying Tesla can't achieve all of its growth plans. It would just have to execute flawlessly, which is hard for any auto company to do, and something Tesla doesn't have a track record of doing. This is all with the backdrop of competitors eyeing the same target market as Tesla Motors is right now. I don't see that ending well, and $300 per share is a long shot in my eyes. Despite my love for Tesla's cars, you won't find me investing in the stock for two main reasons: The automotive industry is ridiculously capital-intensive, and, given Musk's stated ambitions, I'm concerned that the company could be forced to massively dilute existing investors to raise growth capital. The issue for long-term investors is whether Tesla's growth plans will lead to the stock appreciating faster than the market's historical rate of 9.1% CAGR on its way to producing potentially 500,000 cars by 2020, and there I'm not so sure. My main concern is with Tesla's ability to fund the $4 billion to $6 billion cost of the Gigafactory, which is a prerequisite for its launching of the Model 3. Tesla expects its share of the construction costs to come to around $2 billion, of which it's thus far spent $261 million, with construction costs potentially rising to as high as $300 million by the end of the year.. So that’s potentially another $1.7 billion or so in capital Tesla will need to invest into the world’s largest battery factory, and with $2.5 billion in debt already on its balance sheet,the company may be forced to tap the equity markets. In fact, since 2014 Tesla has raised $1.6 billion in convertible debt while issuing $1.4 billion in new shares to help pay for its explosive growth. TSLA Shares Outstanding data by YCharts. With the company planning to ramp up Model X production next year, followed by the launch of the Model 3 in 2017, the rate of equity dilution could greatly increase in the years to come, especially if the market suffers a major downturn between now and 2020, which would force Tesla to sell far more, far cheaper shares to fund its ambitious growth efforts. Two common refrains Tesla bears often use are competition and lack of profits. Competition can't be dismissed out of hand, because it should be expected. But, frankly, it's more likely that electric cars will simply become a larger share of the total market than that Tesla will be disrupted. The old argument that Big Auto and its huge resources will crush Tesla simply rings hollow. With vastly superior resources, competitors are still years away from commercial launch of a true comparable to the Model S, while Tesla has further widened the gap with the launch of the Model X. The thing is, it's almost understandable why the competition is moving slowly. Tesla will sell 51,000 cars this year. GM, Volkswagen, and Toyota sold more than 30 million alone in 2014. So even with its success so far, Tesla is still viewed as an outsider and far from a "real" threat. I think this furthers the likelihood that the company will continue to catch the auto industry flat-footed. 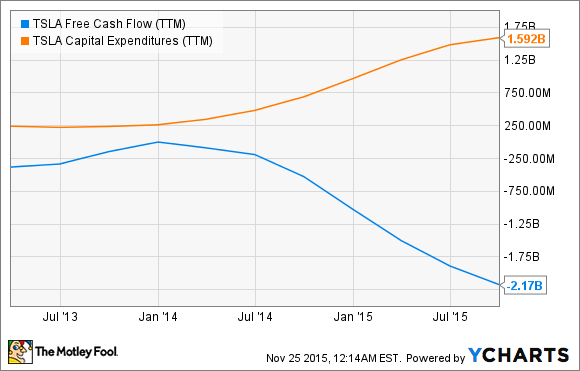 TSLA Free Cash Flow (TTM) data by YCharts. It's important to understand where the money goes. The vast majority of Tesla's cash burn over the past couple of years has been capital investment to increase manufacturing capacity, not recurring costs. 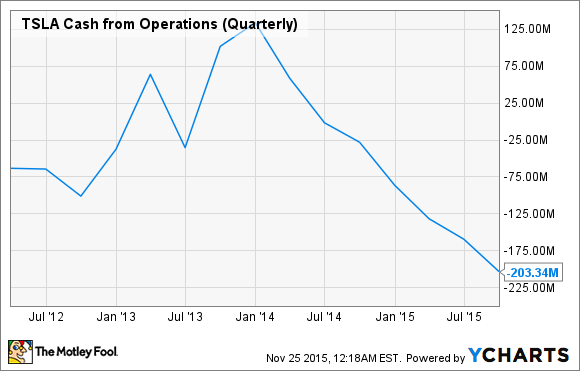 TSLA Cash from Operations (Quarterly) data by YCharts. In 2012, cash from operations declined in the ramp-up to the launch of the Model S, but then sharply improved with sales. What we are seeing now is similar, if on a bigger scale. Tesla has increased operating expenses in the buildup to the launch of the Model X. We should see a similar trend of those investments paying off as sales increase with greater capacity and demand. Add it up, and seeing the company's stock at $300 in 2020 isn't that big of a stretch if it continues to make progress, including the development and launch of the Generation 3 car and the Gigafactory to meet battery demand. After all, that's only about a 7% annualized rate of return from recent share prices -- below the 10% historical average of the S&P 500 -- which would put the stock above $350. But it boils down to this: The company, led by Musk, must keep innovating and disrupting. I'm betting it will. No matter how you look at it, Tesla at $300 per share depends on Elon Musk executing on his audacious growth plans over the next five years and competitors remaining behind the learning curve. There are good arguments that Tesla will meet or even exceed those plans and that it will come up short. Only time will tell who is right about Tesla Motors' future.